Affectionately dubbed the flying nun, Sister Patricia Wall has been a pillar of the Slieveardagh community in Co Tipperary, for more than 20 years. 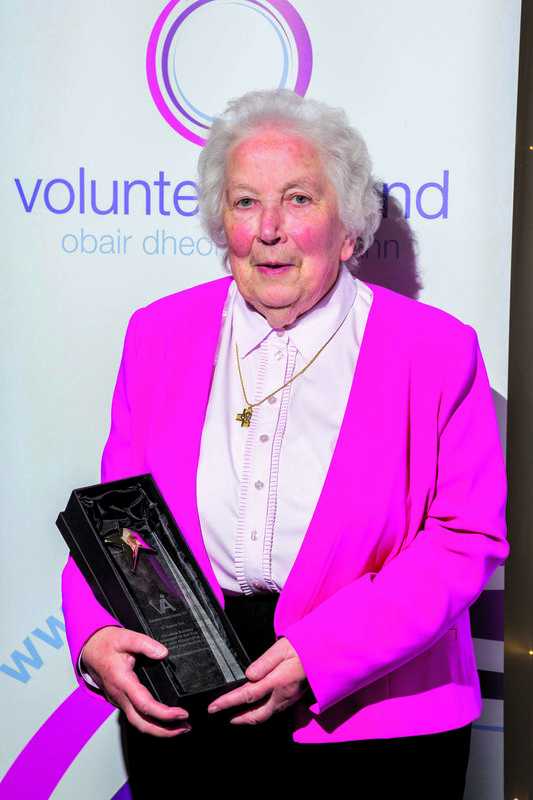 The time and dedication she has given to improving the facilities which benefit local residents, led to her being named Volunteer of the Year at the Volunteer Ireland Awards a few months ago. Sister Patricia’s efforts to help make a difference in the lives of others first started when, as a young nun, she taught in impoverished schools around the world. “I spent six years in New Zealand very early on as a young sister from 1963 to 1968 teaching in a primary school. Then I also went to Zimbabwe from 1987 to 1993 teaching second level to the township girls, on the missions. We were providing a good service to the poorer people,” she says. On her return to Ireland, Sister Patricia found it difficult to get a full-time teaching position in Dublin and moved back to Ballingarry in 1997. Around this time the local convent was closing, which influenced her decision to retire from teaching and concentrate on a different kind of work. Sister Patricia and two other nuns who had lived in the convent, then moved into a house in the village. “It was in a small estate, we were able to rent from the county council and move in. My first movement into community work was with the local residents,” she explains. Along with the other nuns, Sister Patricia oversaw the operation by selecting colour cards, as well as hiring scaffolding and power hoses for the clean-up. The finished result ‘transformed’ the area and was a lovely way for Sister Patricia to get to know her new neighbours. “It was a great introduction into the community. They all came out and helped each other and painted each other’s houses,” she says. Not content to stop there, helping to set up the Millennium Family Resource Centre in Slieveardagh was one of her next projects; an important resource which serves the surrounding parishes. “At the time the Department of Social Welfare were looking for somebody in the area who might get the community together and if we did that, they were going to give us the finding,” says Sister Patricia. The Millennium Family Resource Centre facilitates lots of community based projects such as the Brothers of Charity using it as a day centre for adults with disabilities, Meals on Wheels, a small childcare unit and also training courses for people in the area. According to Sister Patricia community work and fundraising go hand-in-hand and one particular fundraiser four years ago, earned her a quirky new nickname – the flying nun. “We decided that I would do a sky dive. It was then that we got Aware involved because we wanted to go national. There had been a lot of suicides in the area and we felt it was a good national organisation,” Sister Patricia says. Forty per cent of this money was donated to Aware and the rest was divided up between six local charities. Aware was particularly close to Sister Patricia’s heart, as she suffered from depression while working in New Zealand. “I went through a bad spell but I was lucky that after a few years it didn’t continue,” she says. Being named Volunteer of the Year meant a great deal to Sister Patricia as she sees how people value the contribution she had made. Of the projects she has worked on, Sister Patricia feels that they belong to everybody and vows to continue with her community work for as long as she can.